Situational awareness is not simply a mental picture of aircraft location; rather, it is an overall assessment of each element of the environment and how it affects a flight. On one end of the situational awareness spectrum is a pilot who is knowledgeable of every aspect of the flight; consequently, this pilot’s decision-making is proactive. With good situational awareness, this pilot is able to make decisions well ahead of time and evaluate several different options. On the other end of the situational awareness spectrum is a pilot who is missing important pieces of the puzzle: “I knew exactly where I was when I ran out of fuel.” Consequently, this pilot’s decision-making is reactive. With poor situational awareness, a pilot lacks a vision of future events and is forced to make decisions quickly, often with limited options. During a typical IFR flight, a pilot operates at varying levels of situational awareness. For example, a pilot may be cruising to his or her destination with a high level of situational awareness when ATC issues an unexpected standard terminal arrival route (STAR). Since the pilot was not expecting the STAR and is not familiar with it, situational awareness is lowered. However, after becoming familiar with the STAR and resuming normal navigation, the pilot returns to a higher level of situational awareness. Factors that reduce situational awareness include: distractions, unusual or unexpected events, complacency, high workload, unfamiliar situations, and inoperative equipment. In some situations, a loss of situational awareness may be beyond a pilot’s control. For example, a pneumatic system failure and associated loss of the attitude and heading indicators could cause a pilot to find his or her aircraft in an unusual attitude. In this situation, established procedures must be used to regain situational awareness. Pilots should be alert to a loss of situational awareness anytime they are in a reactive mindset. 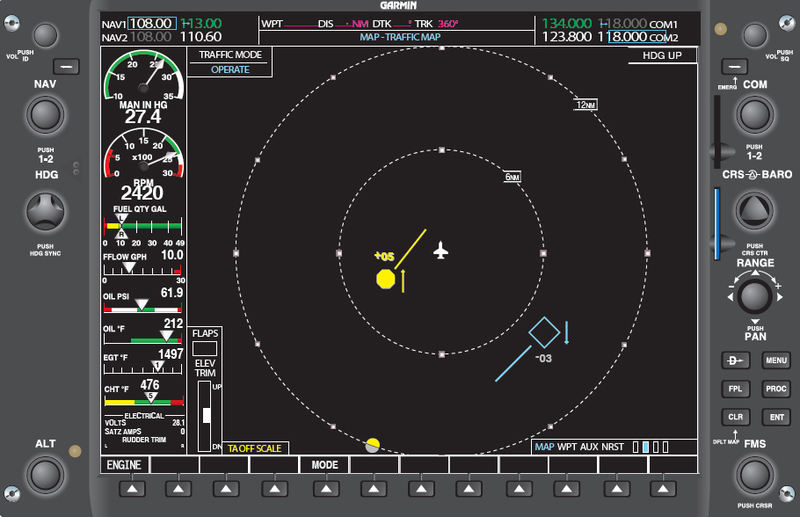 To regain situational awareness, reassess the situation and seek additional information from other sources, such as the navigation instruments or ATC. EFDs have the capability of displaying transponder-equipped aircraft on the MFD, as well as the inset map on the PFD. However, due to the limitations of the systems, not all traffic is displayed. Some traffic information service (TIS) units display only eight intruding targets within the service volume. 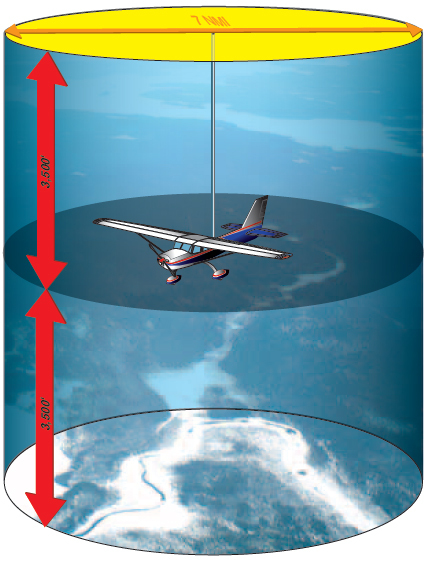 The normal service volume has altitude limitations of 3,500 feet below the aircraft to 3,500 feet above the aircraft. The lateral limitation is 7 NM. [Figure 11-17] Pilots unfamiliar with the limitations of the system may rely on the aural warnings to alert them to approaching traffic. Figure 11-17. The area surrounding the aircraft for coverage using TIS. It is important to remember that most systems display only a specific maximum number of targets allowed. Therefore, it does not mean that the targets displayed are the only aircraft in the vicinity. The system displays only the closest aircraft. In addition, the system does not display aircraft that are not equipped with transponders. The display may not show any aircraft; however, a Piper Cub with no transponder could be flying in the area. TIS coverage can be sporadic and is not available in some areas of the United States. Traffic advisory software is to be utilized only for increased situational awareness and not the sole means of traffic avoidance. There is no substitute for a good visual scan of the surrounding sky.